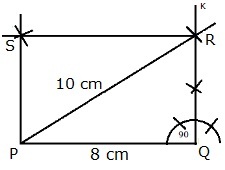 Construct a rectangle PQRS in which PQ = 8 cm and PR = 10 cm. i) Draw PQ = 8 cm. ii) At Q, draw ∠PQK = 90°. iii) With P as centre and radius 10 cm, draw an arc cutting QK at R.
iv) With R as centre and radius 8 cm, draw an arc. v) With P as centre and radius = QR, draw an arc cutting the arc drawn in Step 4 at S.
vi) Join QS and PS.